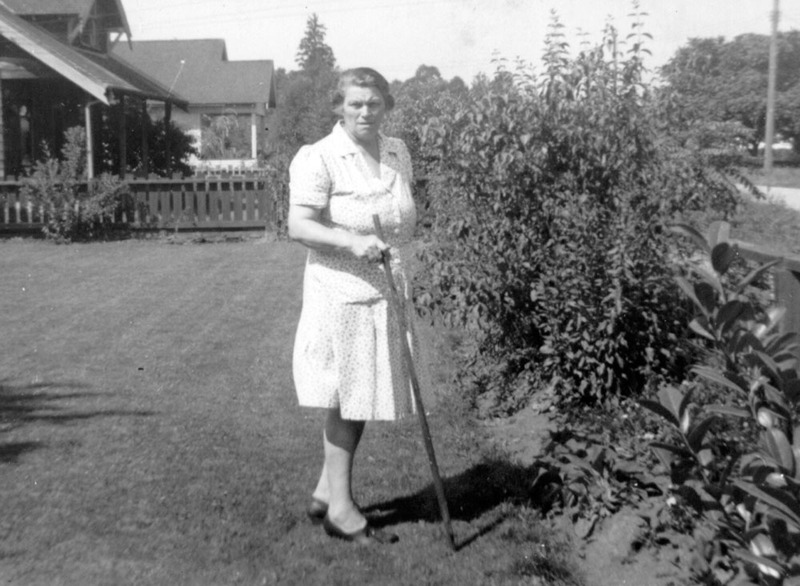 Ethel MacKenzie in the 1930’s in the family garden on McIntosh Street, behind MacKenzie’s hardware store. Harold MacKenzie was born in Manitoba, and spent his early years in there, where he trained as a plumber. Harold came with wife Ethel to Maple Ridge from Saskatchewan in 1923, settling in Port Hammond. In 1927, MacKenzie moved to Haney and established the first hardware store. Harold enjoyed sports, including hunting, golfing and curling. He was one of the few who started the Maple Ridge Golf and Country Club and played the game on the property even before the club was founded. He was a member of the Masonic Order and Eastern Star, and active in the North Fraser’s Pioneers’ Association and B.C. Liberal Association. Harold’s son Wilson joined the air force at the outbreak of World War II, but never left Canada. Wilson was frequently assigned to the fire hall on air bases. In mid-1945, not long after his discharge, council agreed Haney was in need of a fire department. Wilson was interested and soon became involved. Through the years Wilson worked his way up to Fire Captain, Assistant Chief, and in 1962, to Fire Chief, which was one of two paid positions in the department. Wilson retired in 1977 after 30 years with the fire department. Wilson’s wife Nora was heavily involved in the community. She moved to Maple Ridge at the age of 16 as an instructor for a B.C. Government fitness program that provided recreation opportunities to youth growing up in the Depression era. At a co-ed dance class she caught the eye of Wilson, and the two married during the Second World War. They settled in Haney and had two daughters. 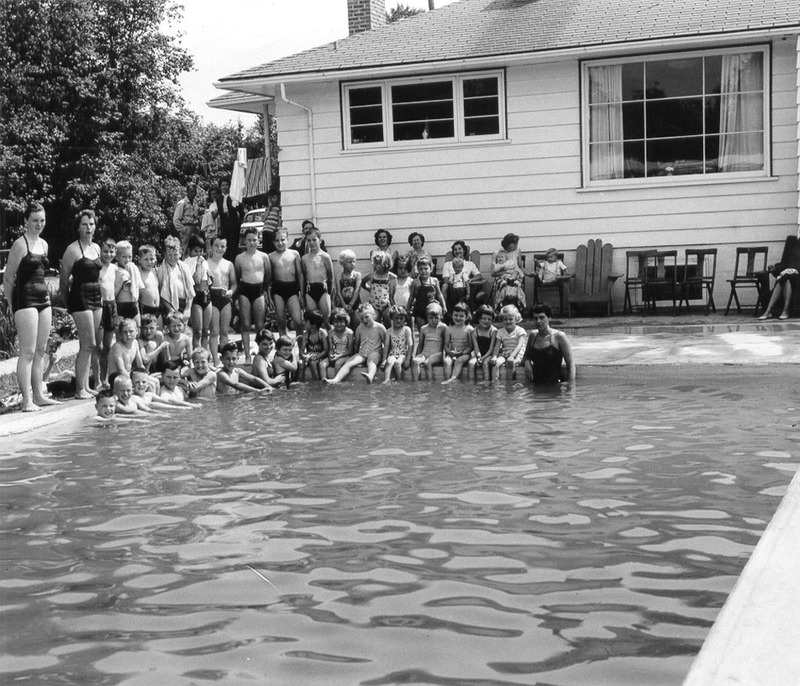 From 1949 to 1956, Nora taught hundreds of children to swim in the Fraser with the assistance of other volunteers in the community. In 1956 the MacKenzie family built a pool in their backyard to hold the swim classes, where two to three hundred children learned to swim each year. One of Nora’s most rewarding moments was having a group of her students rescue a drowning child from the river using a ‘human chain’ technique she had taught them in class. Swimming lessons at the MacKenzie pool before the city’s pool was built. Nora MacKenzie proudly gave lessons in the Fraser River, and then, once she and her husband had built a backyard pool in 1956, at home in Haney. Besides teaching swimming, Nora was president of the Curling Club, sewed kilts for the Legion’s pipe band, called square dances, was President of the Women’s Auxiliary to the Fire Department, and continued to teach dance. Nora also worked part time at the hardware store for fifteen years, retiring at the age of 50. Donald was born in 1914 in Saskatchewan. He grew up in Haney and attended both Haney Central and MacLean High School. After high school he worked for Brackman Kerr Milling Co. He married Carol Best in 1940, and moved to Powell River. He also served in the Canadian Armed Forces. After the war he returned to Haney to join his father and brother in the hardware and later locksmith business on 224th Street. Donald and Carol had three children. Donald also joined the Masonic Lodge and served as Master of Prince David Lodge in 1966.